EMRO offers a limited amount of boarding for cats. We have a special "boarding room" separate from the shelter cats for this purpose. 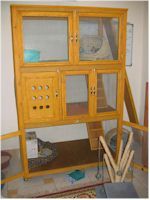 We use "Kitty Condos", which are large wood or metal cages with two or three floors joined by ramps, or single roomy cages with a ledge to jump up and perch. The cages all have a blanket or basket, and cat litter, sand or sawdust litter is used. Not all cages are available all the time. A prepared meal, once or twice a week, are offered (mackerel mixed with bread) and quality dry cat food is fed twice a day. If your cat requires a special diet, their particular food can be left with EMRO and the cat will be given it at the required time. Cages are cleaned daily, or more often, if needed. We have three full-time trained animal workers and there is always at least one resident Animal Worker sleeping overnight and checking regularly. The full-time EMRO Veterinarians check the cats regularly and are also available on-call. If required, we can accommodate “special needs” cats, if their specific medicine has been provided. Un-vaccinated cats will be expected to receive vaccinations at the shelter (to be paid for by owner). Owners should bring familiar objects from home to help the cats settle in - e.g., bed, toys, owner's t-shirt, towels or blankets. Boarding cats are allowed to take turns in exploring, exercising and/or sunbathing in the boarding room. Please inquire as to current rates. Nightly, weekly, and monthly rates are available as well as discounts for shared cages. EMRO is currently in the process of upgrading its cages from wood to metal for better sanitation and comfort/security. 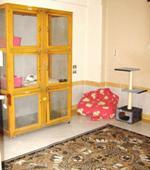 Special Thank You to Ms. Wilmshurst for the donation of the Cat Tree/Climber in our Boarding Room.